I’d like to share two examples of range estimate calculations under winter conditions that were verified by actual trips. I used the same method to estimate the range at the beginning of the trip, and compared with the actual remaining range on the dashboard at the end of the trip. In both cases, the estimate was very close to the final dashboard range. First example was a 57 Km trip. Initial state of charge was 10 bars. Range chart estimates for 10 bars @ 80 Km/h were 137 Km. Temperature was -2C, meaning 22% drop in range. We planned to use climate control throughout the trip to avoid fogged windows, which I estimated would take another 15%. So The initial 137 Km range minus 37% quickly became an 86 Km range. If the estimates were correct, that would still leave us with 29 Km to spare. At the end of the trip, we made it home with 28 Km of range on the dashboard. I used the final dashboard range measured after putting the car in park. Estimated range in Eco mode would be a bit higher, but you have to consider the fact that the last kilometer of the trip was done at low speeds, so things kind of balance out at the end. The range chart estimate is based on constant speed, which was obviously not the case of either trip. Outside temperature was not necessarily constant. The method is clearly not very scientific but it gives me a fairly good estimate of what to expect. The formula will probably change once outside temperature dips below -20C, because that’s when the internal battery heaters kick in. 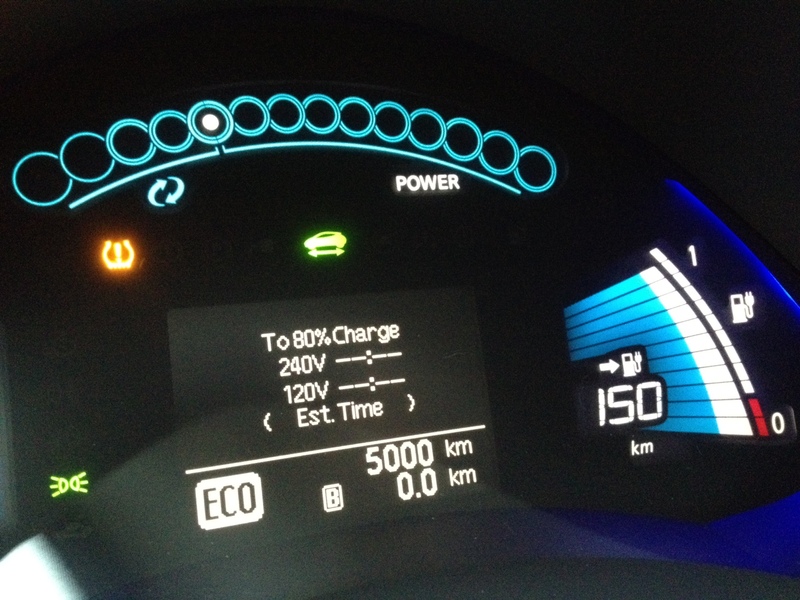 Our LEAF has crossed the 5,000 Km mark today. The car is doing great after 2.5 months since delivery. At this rate, we’ll probably hit 24,000 Km in a year, 20% more than we first predicted. No problems with the car so far, and I haven’t got stranded yet. 🙂 The range has been more than enough for the kind of drive we do in the city, and we’ve been getting plenty of chances to recharge both at home and at work. Cost of ownership has been really low and impressive. We spent about $30 in electricity with the LEAF in October, and $35 more in November, and drove almost 2,000 Km in each month. Charging at IBM helps, but the trickle-charging at mid-peak hours is just enough to cover the 34 Km round trip to work so most of the charging still happens at home, which is much faster, more efficient and can be done at off-peak hours, when all the coal fire burning power plants are safe at sleep (Ontario still has 18% of its electricity coming from coal but mostly to respond to peak demand). These days, I’ve been getting a lot of questions about the winter, though we haven’t got much of a winter yet — barely crossed the freezing mark, but it’s been enough to give us a feeling of things to come. I’ll try to summarize it below. How does it drive in the snow? Not much different than any other car. Winter tires have been working as expected, with ABS and traction control doing their job, so nothing new really. How does it drive below freezing? Response and acceleration are about the same. The *power* (KW) is there when you need it. The difference is in how much *energy* (KWh) you’re able to draw from the batteries at lower temperatures. It basically means the lower the temperature, the lower the range. How far can you go in the winter? The estimates provided by Tony Williams’ Range Chart at the My Nissan LEAF Forum have been fairly precise so far. The chart predicts a 1% drop in range for each 1C drop in temperature below 20C. This is very in line with what I have observed since the temperature started to fall. As an example, I’ve monitored a 76 Km round trip we did last week, mostly on highways. We started with an 80% charge, with the guess-o-meter telling us we had 138 Km of range, which basically meant: if we continued to drive around *our neighborhood*, at 40-60 Km/h, we could drive 138 Km. Not very helpful of course. The Range Chart told me this instead: 10 bars @ 100 Km/h = 116 Km. Temperature was hovering around 5C, so 116 Km minus 15% = 98 Km range. This estimate did not include the use of climate control, which I knew we were going to need in order to avoid condensation. So 22 Km of extra room sounded good enough, so off we went. At the end of the trip, we arrived at home with one bar left, and it had just started flashing. That meant 16 Km of range according to the Range Chart (19 Km – 15%). So in summary, we drove 76 Km out of an estimated 82 Km range (98 total – 16 left), which was a very good approximation considering we used climate control during most of the trip. With heated seats and heated steering wheel, I haven’t felt any need to heat up the cabin so far, even when it’s 0C outside. The energy to heat up the seats and the steering wheel is fairly low, about 40W each, and have virtually no impact in your range. However, once you have passengers in the car, condensation starts to build very quickly and things get complicated. The A/C alone is not strong enough to keep the air inside dry, so you are forced to bring fresh air from the outside, and because this air is very cold, you have to use the climate control to warm it up. That’s takes a lot of energy compared to the heated seats: 4.5 KW initially, and then 1.5 KW once the target temperature is reached (minimum is 18C). Even at the minimal setting, Climate control draws a steady 1.5 KW from the main batteries. It’s a bit hard to estimate how much that will translate into range, but assuming an average 10 KW draw from the motor, that would mean an extra 15% being used. That’s the number I’m using right now to plan my trips, as a worst case scenario, but I still need more hard data to confirm it. 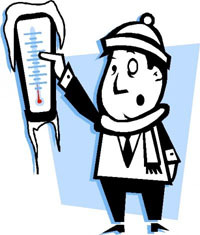 What’s going to happen when the temperature goes down to -25C? No much data on that yet, but I suspect the decrease in range will not be linear. According to Nissan, the battery heaters will kick in at -20C and heat up the batteries to -10C. They will then shut off until the battery temperature falls again and hits -20C. The heaters do not take a lot of power — only 300W, and they work based on the internal temperature of the battery, which is typically higher than the outside temperature. You also have the thermal blankets, and the car itself, to help maintain the internal temperature. You can also help by starting the charger in the morning before you leave. Charging causes the batteries to warm up and that will boost your range a bit. So overall, what do you think the impact of a harsh winter will be? I “guesstimate” a worst case scenario of 40% decrease in range for the coldest days of the year. That will still put us within a 100 Km range on a full charge, which is still well within what we usually drive. No long trips to Ogdensburg for sure, but not a significant impact to what we currently do. – We normally charge to 80% at night. That helps prolong the lifetime of the battery and also saves energy. However, during the coldest weeks of the winter, we will probably have to push the charger to 100% overnight. – We will probably need a boost during the day. In between arriving from work and doing errands in the evening, we will probably need to plug in during supper (yes, on-peak hours…) in order to get the extra range if we really need to or just to be on the safe side. – We’ll have to get used to keeping the cabin cool rather than running a furnace inside the car. We’ve been used to hot cabins all these years driving gas-powered cars, to a point of discomfort sometimes. We’ll need to change that habit in order to use energy more efficiently. Driving the Nissan LEAF in the city is a no-brainer in terms of range. We rarely need to drive more than what the LEAF can go on a full charge, and we’re always relatively close to places where we can recharge during the day (home, work, even the dealer). But on road trips, this scenario changes significantly. I recently had to drive to Ogdensburg, NY in order to pick up a set of snow tires. Not that we can’t find snow tires in Canada — we certainly can, but for some strange reason, tire manufacturers impose much higher prices north of the border so buying the same tires in the US can save us several hundred dollars (about $300 in my case). 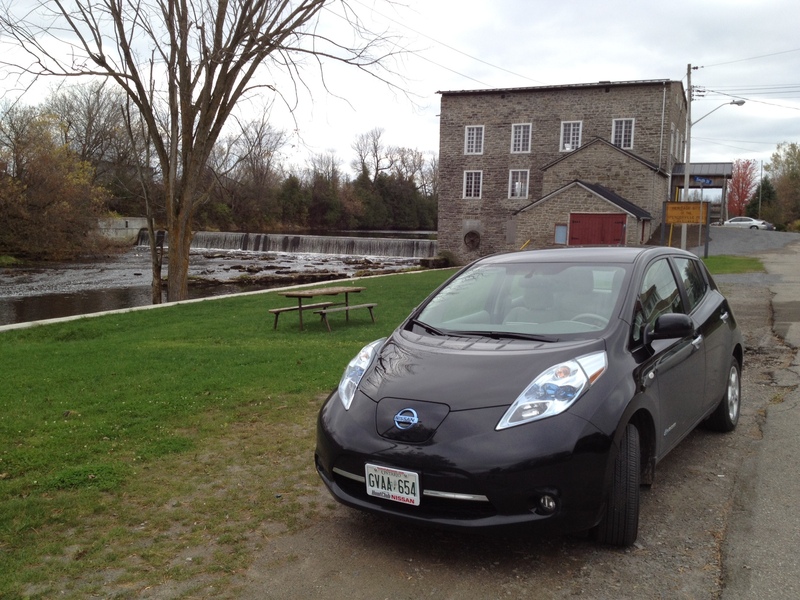 A round trip from Ottawa to Ogdensburg is about 165 Km, which is right at the limit of the advertised range of the LEAF, so the trip would have to be very well planned. On a side note, I did have the option to drive our “range extender” (my wife’s car) instead of the LEAF on this trip, but that would take away all the fun, wouldn’t it? Obviously, that wouldn’t be enough for a round trip to Ogdensburg, but the result falls very closely to what the Nissan LEAF Range Chart predicts. According to the range chart, I would need to lower the target speed down to 70 Km/h in order to achieve a safe 177 Km range. However, this range estimate assumes an outside temperature of 20C, which is quite rare around here in November! Lower temperature means I would have to lower the speed even more, so it became clear that taking the highway would not be a practical option. With the highway out of the picture, the next step was to find a good route over country roads. 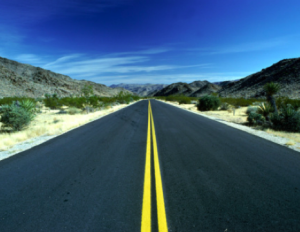 Luckily, there are a lot of quiet and well paved roads that can take me to the same destination. These roads are quite pleasant actually, going through small towns like Spencerville, ON and beautiful farms. At this pace, I would be able to go all the way to my destination and back on a single charge. In addition, the place where I was buying the tires from (Bill’s Tire) would let me trickle charge while in there, and even a bit longer if I needed to. This would give me some comfort room. I also contacted a friend who lives in Kemptville, right on the route and 40 Km from my house, in case things didn’t work as planned and I needed to make an emergency stop for a recharge at his house. One final factor to consider was the extra weight of the tires I would be bringing home. I would also be riding on snow tires, which have more rolling resistance than the original Ecopia tires. I didn’t have any data to estimate the impact on performance. The extra weight would add 2.5% to the weight of the car, but the snow tires I would be buying were also low rolling resistance tires. I assumed the drop in performance to be within the margin of error of my estimates, and that I could compensate by monitoring performance and adjusting my speed accordingly on my way back home. I started the drive to Ogdensburg on a Saturday morning. I woke up early and started on the same route I had done previously. Only that this time, conditions were quite different. Early in the morning, the temperature was -7C. Yes, negative 7. I lost the first bar very quickly, with less than 10 Km. Reducing the speed didn’t help as the second bar went out fast too. After 50 Km, my average was 10 Km /bar. I figured at that pace, I would get to my destination with only 4 bars left, and require at least 4 hours of trickle charging to get me back home. So, it was tough decision to make, but I had to turn back and try another day. The weather forecast was calling for much better weather during the week. Wednesday was promising a high of 15C so I planned to leave work early and head to Ogdensburg, taking advantage of the higher temperature. Leaving from work would only add 4-5 Km to the round trip, and thanks to IBM, I was able to top off the batteries back to fully charged at the parking garage before I left. The trip to Ogdensburg took 86.3 Km and arrived there with 6 bars left. That was about 14 Km/bar, which was really really good. The estimated range left was 95 Km, and I needed only 82 Km to get home. 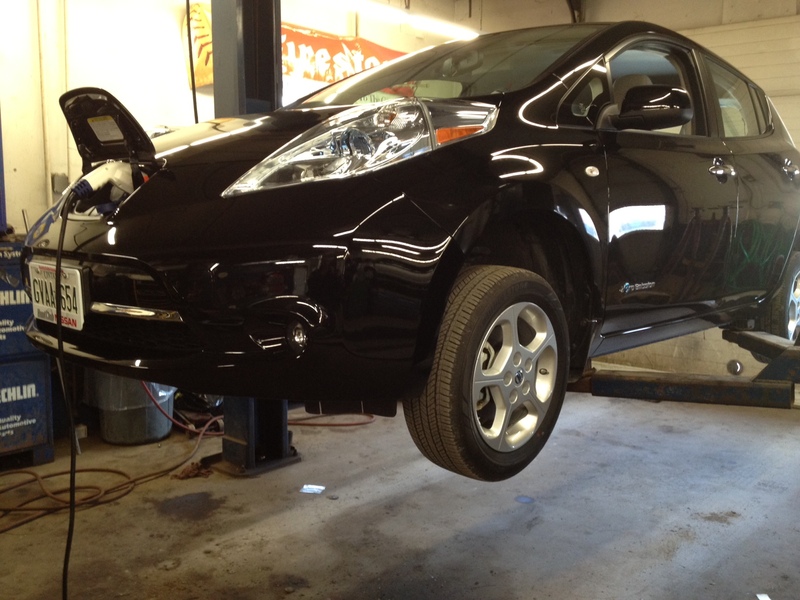 To be extra-safe, I asked the guys at Bill’s Tire to plug in my Level One charger as soon as they parked the LEAF in one of their service bays. They had absolute no problem with that. The service only took 30 minutes — the tires were already mounted on the rims when I arrived, but they let me continue the charge until I got at least 10 Km of extra range for safety. I ended up plugging in for 70 minutes which raised my estimated range from 95 to 106 Km. With the snow tires on and the original tires tucked away in plastic bags over the folded back seats, I was ready to head back home. Over the border, I had to stop at customs to declare the purchase and pay the Canadian sales tax (13% HST). Tires made in North America are duty free. Once on Canadian roads, I started to monitor the car performance. Driving at 65 Km/h, I was averaging 13 Km/bar, which was good. 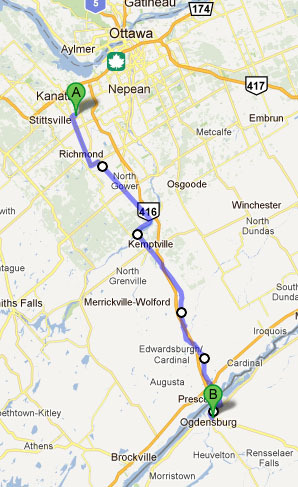 I drove through Kemptville, where my friend lives, with about 60 Km of estimated range, and I needed 40 Km to get home. I didn’t see the need to stop for an emergency charge so I stayed on course. At this point, range anxiety turned into temperature anxiety. With the sun about to set, the temperature outside started to drop quickly. First 14C, then 13C, now it was 12C. For safety, I changed to a quieter back road that allowed me to reduce the speed to 40 Km/h for about 17 Km, while also shortening the distance that I still had to get through. The final 12 Km were fairly easy, even though I had to go on regular 80 Km/h roads with only one bar left. The “guessometer” was estimating a range of 29 Km so I could safely raise the speed to 65-70 Km/h without any problems. When the estimated range dropped to 20 Km, the last bar started to blink and the center display changed to “battery level is low”. Fortunately, I was only 5 Km from home. I arrived there safely with 15 Km of range to spare. Back at home with 15 Km to spare. – Max speed 65 Km/h, down to 40-50 Km/h in city areas, 40 Km/h for 17 Km. – Back at home, recharging from less than 10% to 80% took exactly 4 hours. I know for a fact that charging from 80 to 100% takes 1.5 hours, which brings the total to 5.5 hours. I really don’t know where the advertised 7 hours recharge time comes from. – The tires I got were the Michelin X-ICE XI2 205/55R16. – The name of the tire store is Bill’s Tire Center, 1000 Patterson St, Ogdensburg, NY (315) 393-7660. Great people and great service. Cost per tire was $133, $50 rims, $10 installation, plus a $2.50 waste tire mgmt fee. Total with taxes: US$836.04. Same service in Ottawa would cost C$1150 + HST. – I didn’t install tire pressure sensors inside the snow tires so now I get this yellow alarm on the display. Not sure if there’s a way to disable the alarm. A set of pressure sensors costs $290 at the dealer. Maybe I’ll get some next winter. – Crossing into the US, I got a *lot* of questions. Not about me, but about the car! Tomorrow it will be exactly four weeks since we took delivery of our Nissan LEAF. It’s been a tremendous experience but what probably impresses me the most is how inexpensive it is to drive: almost 1,700 Km for less than $25. That’s about $1.50 per 100 Km! For comparison, our Corolla would need 116 liters of gas to get this far, at a cost of $145. And our old Sienna, which we just sold last weekend, would need 181 liters, at a cost of $226. Since the Sienna was the car I was driving the most, that’s about $200 saved in a month! However, some of these savings come from the fact that my employer IBM allows me to trickle charge at work. I do it for about 4 hours during the morning, in order to avoid the afternoon’s peak hours. That’s about enough to recoup the round trip to work. Without it, I estimate that my costs would likely be $2 per 100 Km, which is still very impressive. 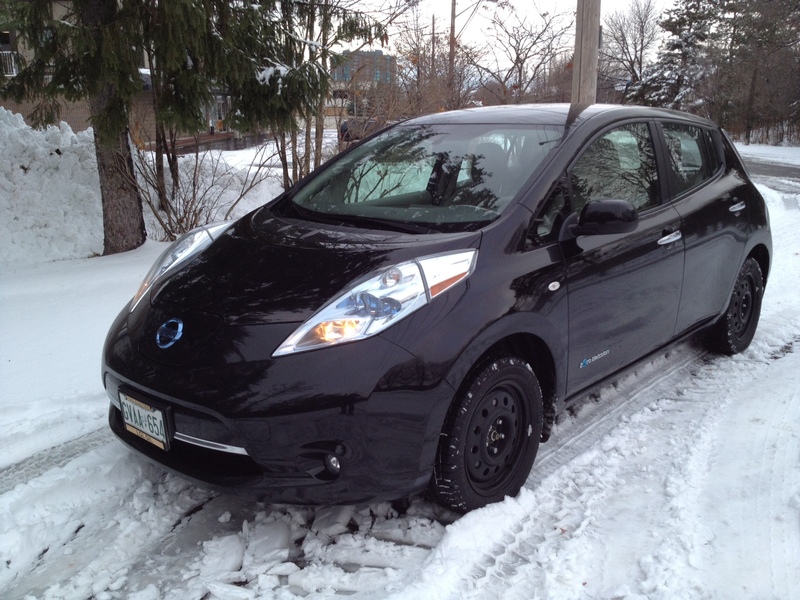 Next week, I’m planning an adventure trip to Ogdensburg, NY to purchase a set of winter tires, and I’ll be driving the Leaf! Wait. Why are you going to the United States to buy snow tires? Simple. Because they are so much cheaper over there . I’ll be getting a set of four low rolling resistance MICHELIN, X-ICE XI2, 205/55R16 + rims. All balanced and installed for US$836. The tires are made in North America so there are no duties at the border, just the HST. After taxes, that’s $350 less than buying them here in Ottawa. The next question is, how am I going to get that far and still have enough charge to come back? The round trip is tight: 167 Km in total. It might sound OK given the advertised 160 Km average range of the Leaf, but that’s for mostly city traffic and we’re talking highway here. 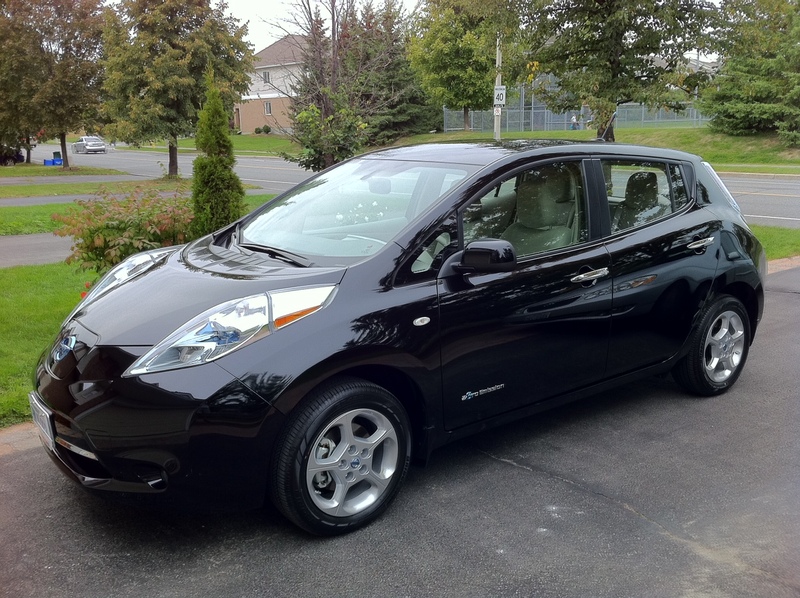 Opposite to what we’re used to with gas-powered cars, the Leaf is less efficient on the highway than it is in the city. On the highway, you spend a lot of energy to cut through the increasingly higher air resistance, while in the city you’re going much slower and taking a lot of advantage of regenerative breaking. I can drive 185 Km on a single charge in the city, but on the highway, even going 10 below speed limit, I can only drive 130 Km on a charge. So how am I going to get there? First, I won’t be taking the highway. Instead, I’ll be following some fairly pleasant country roads where I can average 70 Km/h. The distance is about the same and it’ll be a Saturday so I’ll have the time. Second, I’ll be driving in Eco mode, very conservatively. Third, the place where I’ll be installing the tires will let me trickle charge while the service is being performed, and a bit more if I need to. This should give me the extra range to get back home. And finally, to be extra safe, I contacted an old friend that lives in Kemptville, ON, 128 Km into the round trip and only 39 Km from home, and he’s more than happy to let me trickle charge at his house if I really need to. I already booked an appointment for next Saturday, Oct 29, so wish me luck! We had a couple of chilly days this week here in Ottawa and we took the opportunity to test the cold weather package for the first time. It wasn’t *really* code yet, just a few degrees above zero Celsius (32F), but just enough to familiarize with to the winter-related features of the Leaf. First in the list were the heated seats. There are two temperature levels: Low and High. We tried both settings and the low one was more than enough for this time of the year. The back seats are also heated and the switch is on the side of the front passenger seat. We only had one person on the back and we were not sure if the middle seat is heated or not. Assuming the middle passenger will be squeezed but two (hopefully warm) people, I don’t think a heated seat in the middle would be necessary. The heated steering wheel is *really* nice. It feels very warm and comfortable. Gone will be days when I had to put my hands in front of the air flow to get some heat. You turn the heater on by using a switch on the left panel, between the steering wheel and the door. There’s only one temperature level. There are really only two reasons why you would need a heated air flow: one, to heat up your feet, and two, to get some air flow on the windshield and help get rid of the fog. That’s probably the settings will be using the most. – Use the heated seats and steering wheel as much as you can and program the air temperature to the minimum level of your comfort. The lowest temperature you can set is 18C (64F) but I found 20C (68F) to be already quite comfortable. – Pre-heat your car before you leave and while it’s still plugged in. You can do that remotely using the Nissan Leaf app on your smartphone. This is very important because most of the energy is spent bringing the temperature up to the level you programmed so it’s better to do that with the energy from the grid, not from your battery. Once the temperature is there, keeping it at he same level doesn’t use as much energy, so it will have a much lower impact on your range. The rear window defrost works fine to get rid of the fog. That’s how far we tested it because we haven’t had any real frost yet. That will have to wait a bit more to be tested. I also notice the Leaf writes a message “Low outside temperature” on the display when you first turn it on if the temperature is around 2C (36F). I think that’s about it for now. It’s still too early to say how much the cold will affect our range, but it’s been a good exercise to start getting used to the new routine and learning how to use the heating items more efficiently. It’s been a week already and we’re still excited to own and drive a Nissan LEAF. We had very high expectations, but the Leaf has exceeded every single one of them. We’ve driven 546 Km already since taken delivery of the Leaf last Friday. That’s way above average for us. At this rate, we’re on the way to drive more 28K in one year. Nevertheless, We’ve never went back home at night with less than 40 Km of range left. My longest drive in one day was 141 Km, and a bit of Level 1 charging at work kept any feeling of range anxiety out of the way. Electricity consumption numbers for the first two days: 33.6 KWh ($3.96) for 198 Km driven (80% city, 20% country roads). Average 5.9 Km/KWh. With gas at $1.207, that’s equivalent to 1.66L/100Km. Quite impressive. Monday was my first trip to work. The ability to trickle charge at the office is great but makes the cost calculations a bit more difficult. Without the reports from the smart meter, I can’t tell for sure how many KWh went into batteries, but I do know that trickle charging alone is not enough to keep me going during the week. I still need to Level 2 charge at home. For the first four days, my Level 2 charger used 51 KWh of electricity, or $6.02 (5 liters of gas). 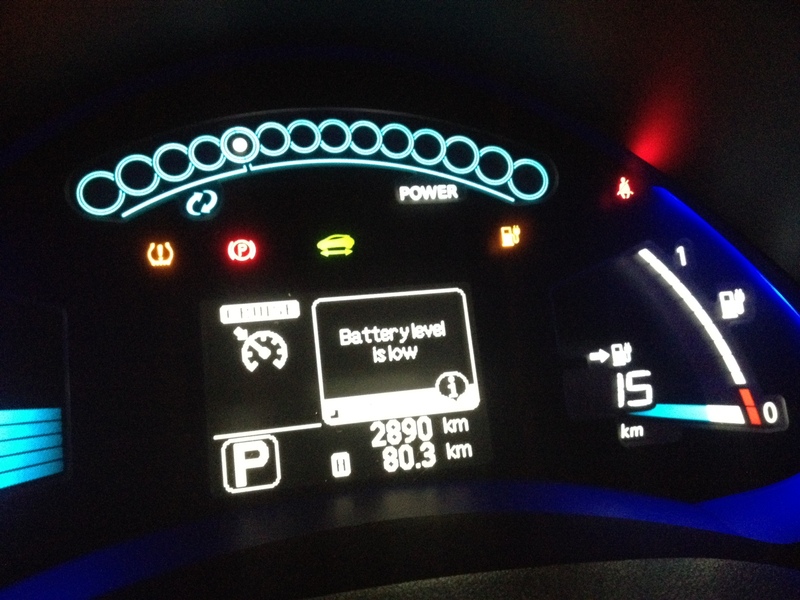 With a little boost from IBM’s level one charger, I was able to drive 339 Km, or 1.47L/100Km. 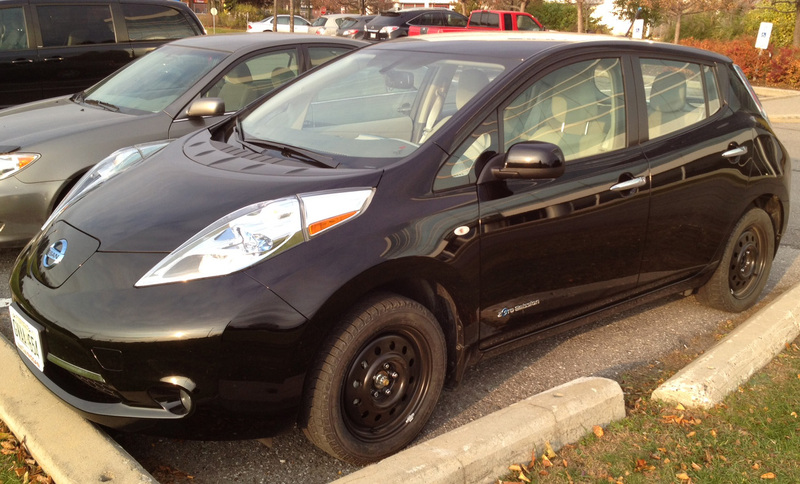 The Leaf continues to be by far the best car I’ve ever driven. Reminds me the AMC slogan: Silence is golden. And at the same time, I leave every other car behind after the traffic light goes green. Amazingly fun to drive. People on the road don’t really notice the Leaf is a special car. I’ve kept a bit of an eye on other drivers and pedestrians, to see their reaction, and there really isn’t one. My friends get surprised when they see the “electric car” for the first time because they expected something very small or very odd shaped, not a 5-door roomy hatchback. I had four adults already in the car and they were all impressed by how much space they had inside. Space in the trunk is also not bad at all. At one point we had 3 or 4 gym bags with lots of room to spare. Not a problem for groceries either and if you need more room you can flip the backseats. I gave two more interviews after delivery day. One to a university radio station in Toronto and another to the local newspaper, Kanata Kourier. I took the reporter, Jessica Cunha, for a ride around the neighborhood and nearby roads, while answering all of her questions. I think it was the best interview so far. We have two reserved parking spots at IBM. They’ve far apart so I can’t always see who’s using the other one. Today I drove by and saw an electric bike charging there. It didn’t prevent an actual car from parking there so I guess it won’t be a problem when someone else at the office starts driving an electric car to work. I’ve been voluntarily limiting the Level 1 charging to mid-peak hours (7am to 11am). We still have several coal-fire power plants in Ontario used during peak hours so I want to avoid getting dirty electricity from them (the Leaf would cough). In the winter, the time-of-use schedule changes so I’ll be able to recharge between 11am and 5pm. 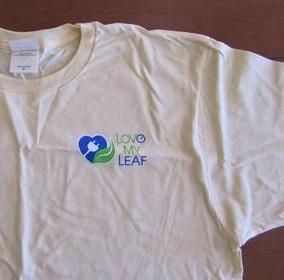 I took the Leaf to a charity garage sale the day after it was delivered. People would have to give a donation to get a tour of the car. More generous donations would get a ride around the block. I was also invited to attend the monthly meeting of the Electric Vehicle Council of Ottawa. I got there 30 minutes before the meeting so that people had a chance to see the Leaf at the parking lot, together with a few other electric cars, mostly ICE cars converted to plugins. It was a bit of a short notice and had another commitment the same night. I was able to speak and answer questions at the beginning of the meeting, and as a token of their appreciation, I was presented with a free one-year membership which I intend to use. Not much to say here. Probably the best single thing in this whole experience! iPhone integration works perfectly. The car connects automatically after you turn it on. You can answer phone calls on the screen, and if you were listening to a podcast when parked your car, that same podcast resumes playing, even with the iPhone still in your pocket! Same for any music. Really neat. The navigation system is fairly good, with both 2D and 3D views. I’m a bit used to the way Google Maps works on my phone so it takes a while to get used to a different way of displaying things. I also noticed some of the newer streets in Ottawa are still not showing up on the navigation map. Wondering how that will get updated. I programmed the HomeLink garage door opener tonight and it worked perfectly, but you do have to follow the instructions on the owner’s manual. By the way, I think this is the first car I had that I actually *read* the owner’s manual. Lots of info in there, makes it easier to figure out all those buttons on the dashboard. The iPhone app also works very well. I’ve turned on climate control a few minutes before I left work, just for fun because it wasn’t any hot, and it was really neat to see it working. It will be very useful in the winter. You can configure the car to send you emails and text messages for different events. The most useful is the one that alerts me if I forget to plug in the car at night. It also alerts me if I leave the car charging at work and the power in the parking garage goes out or someone disconnects the charger. I’ll have to dig really deep to find anything wrong with this car, but I’ll give it a try. The data access is a bit too slow. We’re used to immediate responses on everything we do online, but getting updates from the Leaf may take 30 seconds to a few minutes. Downloading information from the touch display is also slow — it’s more like an old “Edge” phone browsing the web, not a 3G phone. I also find the regenerative braking in Eco mode way too aggressive and even dangerous if someone is following you too close. When you take your foot off the accelerator, the car decelerates very quickly, almost like you’re braking. But without the stop lights. I think that’s all for this week. I’ll try to do smaller posts more often for now on. A week of updates turned out to be a very long list!